Lake Buchanan, a 23,060 acre impoundment of the Lower Colorado River, is 30 miles long and 5 miles wide at its widest point. Buchanan's shoreline is 124 miles long. Buchanan's deepest point is 132 feet. Lake Buchanan was impounded in 1937. The north end of the lake comprises some sheer rock formations, waterfalls, and lovely scenery. 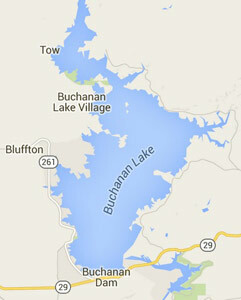 Lake Buchanan is located in the Highland Lakes area of the Texas Hill Country. The lake is 60 miles northwest of Austin and 95 miles north of San Antonio. It is about 200 miles south of Dallas and Fort Worth and 200 miles west of Houston. The Lake Buchanan area is home to many types of wildlife and species of birds. This makes the area a popular destination. Boat excursions are available for birders and nature lovers of all kinds. Lake Buchanan is home to the American Bald Eagle during winter months. Avid bird watchers take part in counting the eagles each winter. Lake Buchanan is also known for its great fishing opportunities. Fishermen catch all types of fresh water fish including crappie, largemouth bass, catfish, hybrid bass, white bass, and stripers. Other activities in and around Lake Buchanan include the annual Lake Buchanan Regatta and Dam Jam which features the regatta, live music and plenty of other activities. Granite gravel shores around parts of Lake Buchanan, provide ideal beachs for swimming, wading and sun bathing. Visitors can also enjoy trips to the nearby winery, or just relaxing and enjoying the beauty of the Texas Hill Country. Because Highland Lakes area is popular with tourists, birders, fishermen, there are many restaurants, resorts, RV camps, cafes, motels, lake houses, and other accommodations readily available throughout the area. Nearby cities and towns include Burnet, Llano, Kings land, Bertram, Lamp as as, and Marble Falls. Stripers roam Lake Buchanan's open waters. Fishing guides use the team approach to find and get on the stripers. Guides stay in constant radio contact with each other. When the stripers are located, all of our clients get to share in the action! Stripers bite 12 months a year so I guide trips all year round! I get as excited as my clients when they hook on to a fish. When the pole is bent over to the water I love to say "Fish on! Fish on!" I clean and bag all the stripers you catch. All you need to bring is your fishing license, food ,drink, snacks, etc. Oh, and be sure to dress for the weather on Lake Buchanan. I'm looking forward to taking YOU fishing! See ya soon!